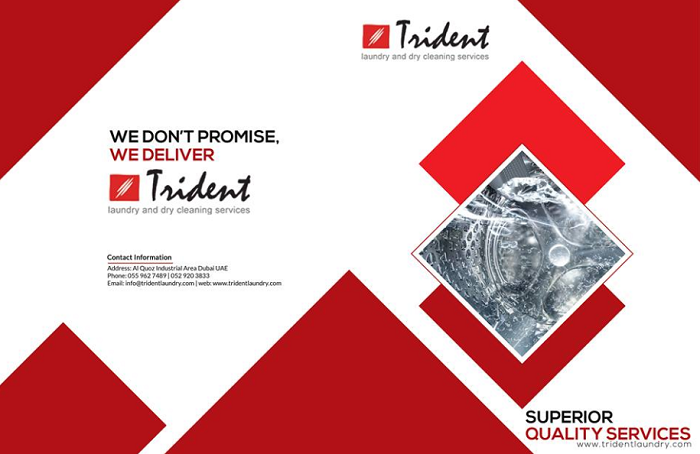 Trident Laundry & Dry Cleaning Services - We don’t promise we deliver. We take care of things which you don’t know. 9 + years of being laundry and dry cleaning services. Located in Al Quoz Industrial Area in Dubai. Houses an 8,000-square-foot plant with the latest in laundry and dry cleaning technology. The steam-operated unit, equipped with sophisticated laundry equipment to provide all types of laundry and dry-cleaning services. Can process up to 8 tons of laundry per day. Uses high quality Bio cleaning products for our cleaning process, manufactured in Scotland and supplied by Messrs. Arpal Gulf. Pays particular attention to the details throughout the entire washing, dry cleaning & pressing process. Superior quality service and product has been our mainstay in business and will continue to be the way we measure ourselves as we grow.